After weeks of campaigning, hundreds of Concordia University students voted on the Boycott, Divestment and Sanctions referendum question this past week. But the ballots for the controversial question have not been counted and there’s still a chance they never will be. 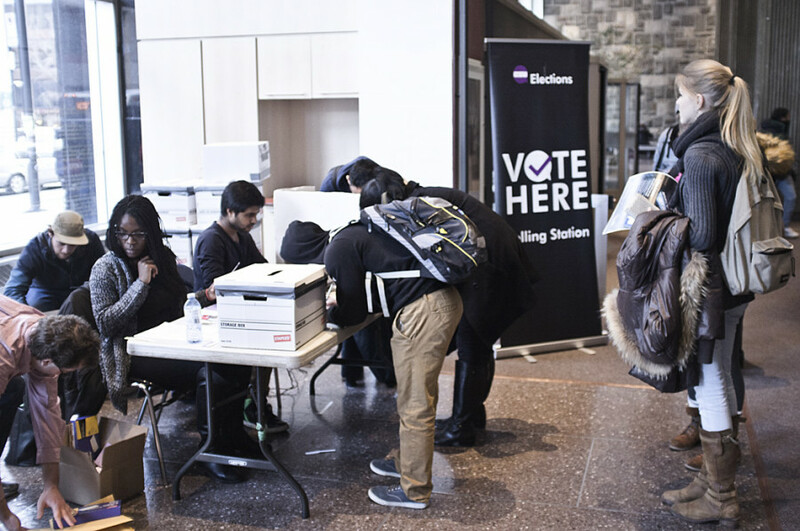 The vote count’s indefinite suspension on Thursday was announced in an email by Andre-Marcel Baril, the Concordia Student Union’s Chief Electoral Officer, who said there was an “overwhelming” amount of “complaints” about the referendum question. An independent firm that practices law and specializes in “interpreting specific institution bylaws and regulations” will be consulted for future action, according to Baril. The firm’s name has not been disclosed and a budget to hire the firm has been approved by the CSU, he added. “For important issues like this, I think there should be something set up—like a support system—where it’s not just one person’s responsibility,” Baril told The Link. The CEO added that he is “optimistic” the ballot count will happen, but throwing out the question entirely remains a possibility, albeit an “extreme” one. “That [alternate] was a horrible question. It was pretty much asking, ‘Do you hate Israel?’ That’s how we see it,” Hoyos said. “We did not ask that question. That’s what people see when they go to the ballot. The Judicial Board chair Zach Braman told The Link that the new question incorporated the “most reasonable, clear and least ambiguous” phrasing. The board, made up of five members, reached a unanimous consensus. The reason the Judicial Board meeting did not happen earlier was because a CSU regulation states that the emergency window for appeal is only available 24 hours prior to voting. Baril said that this was probably created to better deal with issues regarding candidates rather than referendum questions. He already wrote a recommendation to change its time period in his evaluation report. “I think the idea of pushing [the emergency window] back a week when you’re talking about a referendum question—especially when you’re talking about changing it—it would be a very responsible thing to do,” Baril said. Zach Ross, a member of the Concordians United Against BDS committee, said that Baril’s second edit—which produced the previous version of the ballot question tossed aside by the JB—violated CSU by-laws. He said they were not notified of a change to the referendum question at least seven days prior to the voting. He added that his group continued campaigning with the previous question for “four days” after its release. Based on this accusation, Ross originally called for the cancellation of the question completely. Baril denied the accusation and said that he publicly posted the altered, previous iteration of the question on Nov. 16 at 8:15 p.m., which is more than seven days removed from the voting period. The CSU CEO provided evidence in the form of a timestamp of his post on his personal website. He added that he did not directly contact any member from the Concordians United Against BDS committee after the change. On further review, he said that he understood their complaint. “To be entirely frank, that was also at a time where things were happening and I didn’t have the legal or bylaw responsibility [to tell them],” the CEO told The Link. Ross also said that the previous iteration mentioned a “vague” timeline for how long the boycott will last, that it did not define what constitutes Palestine’s borders, that there were no parameters for how the CSU will conduct a boycott, and no “universal principles of human rights” were explicitly available for reference anywhere. With the change to the alternate question, new, separate ballots had to be printed late into Monday night. The new ballots did not have removable tabs like the ones the other referenda were printed on. Baril said there is “no requirement anywhere in the regulations” for every ballot to have a detachable tab, which called into question the reason for their presence in the first place. “The only thing it needs to have is to be labeled with specific serial numbers and it has to say which number of the referendum questions it is,” Baril told The Link about requirements for a ballot.